Rating: As good as it’s always been! When I first ate at Matsuhisa 15 years ago it was a revelation. I’d been eating all this great traditional sushi for years and here was a totally new — even avant garde — take on the cuisine. 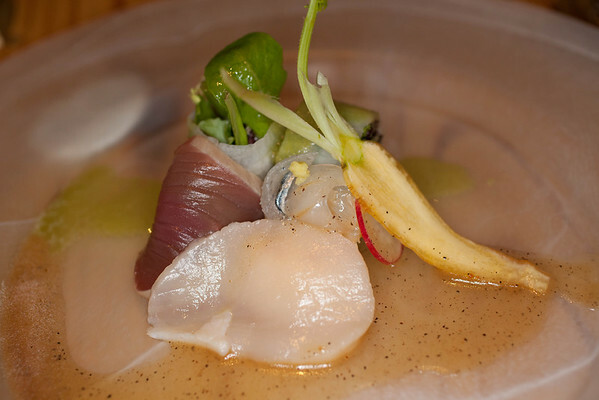 Classic dishes like yellowtail with jalepeno have made there way onto countless less innovative menus. It’s been awhile since I’ve been here, and I felt the hankering to know if they still had the stuff. Nobu, a Japanese native (obviously), came to LA by way of Peru. 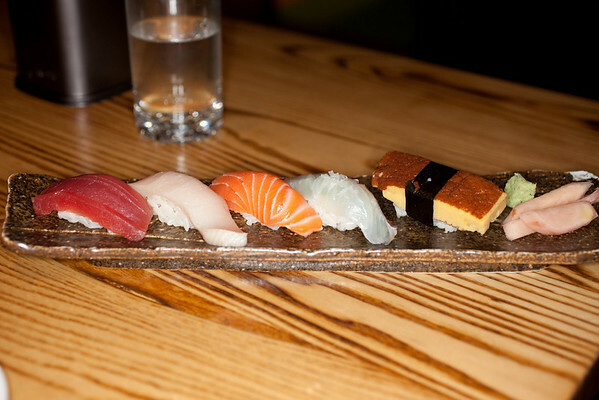 And this is apparently the real genesis of the “Nobu Style,” mixing traditional sushi with Peruvian flavors. Apparently it has a relationship even to Peruvian street food. I myself only spent an hour int he Lima airport, so I can’t testify to that. 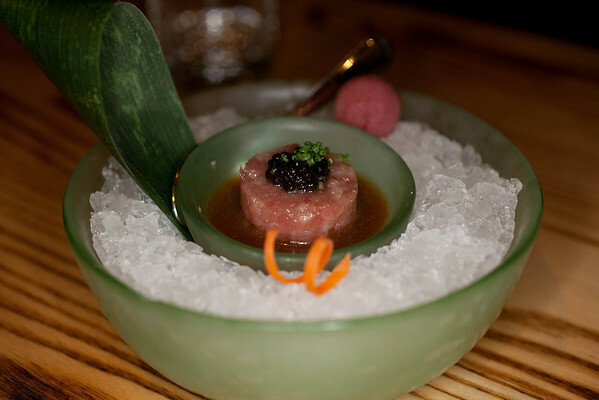 A Matsuhisa classic, “Toro tartar with caviar and a miso ponzu.” I’ve always loved the combo of the rich fatty toro and the acidic punch of the sauce. This theme of adding acidity to the fish is a consistant one. 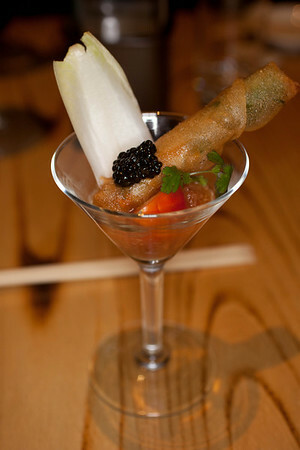 “Seafood springroll with heirloom tomato and caviar.” Certainly a tasty spring roll, and a dish I’ve had here before. Still it tastes mostly like fry and tomato. Good fry. Clockwise from the back left. 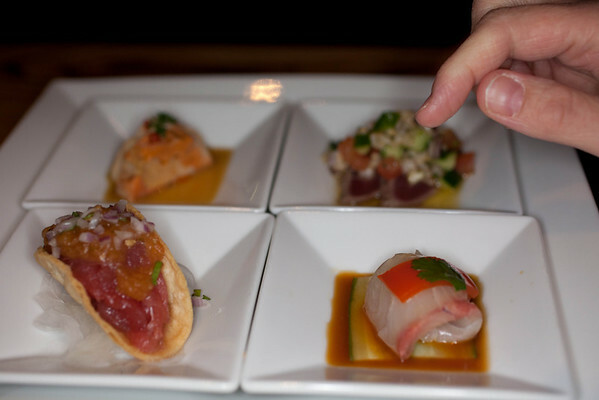 Monkfish liver with a little chille, tuna with onion and cucumber salsa, young yellowtail with ponzu, and spicy tuna taco. 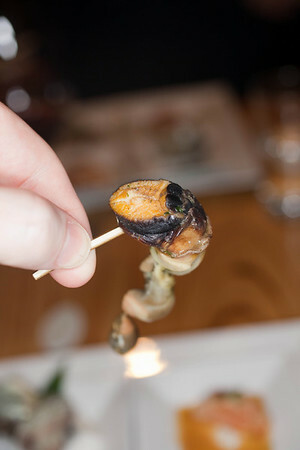 All of these were tasty, but I particularly liked the rich monkfish liver and it’s combined vinegar/spice tang. 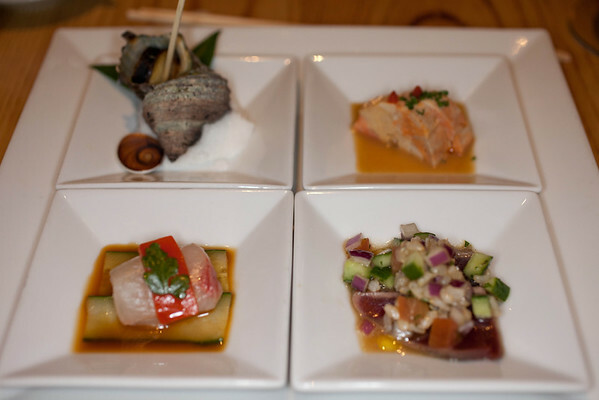 Japanese baby conch, monkfish liver with ponzu and chille, tuna with salsa, young yellowtail with ponzu. The conch pulled from its happy little home, coated in butter and parsley. This has a bit of chew to it, and a bit of bitterness, but is actually very pleasant. “Sashimi salad,” japanese scallop, tuna, mackerel, daikon wrapped greens. All very fresh. The scallop was particularly good. I love raw japanese scallop. Cooking them is a crime. Nobu has very good dressings. In fact, he sells a line of them commercially! Half giant santa barbara prawn with cilantro, ponzu, and mache. Good sweet prawn. Too bad it didn’t have a nice juicy row like they sometimes do. Seared toro with soba noodles and miso sauce. 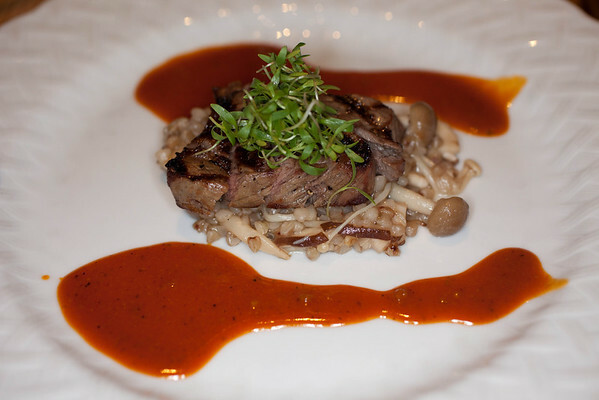 Kobe beef, farro, mushrooms, and chipolte chili sauce. This was a really tasty dish. 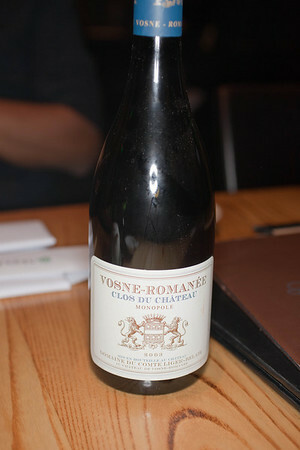 The sauce had a bit of heat, and that smoked chili flavor, paired perfectly with the tender/rich meat and the grains. Left to right. Tuna, yellowtail, salmon, red snapper, tamago (egg). Fresh wasabi and picked ginger. 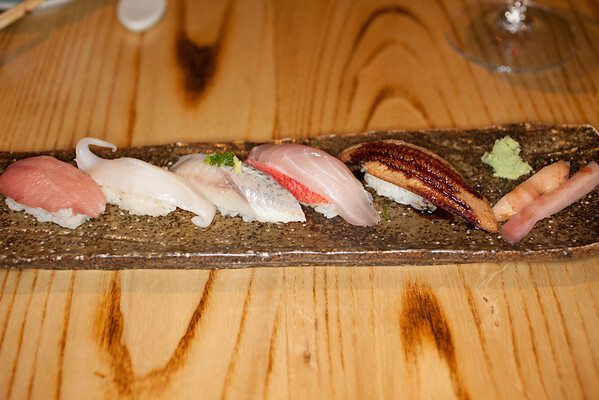 Toro, squid, mackerel, kanpachi, sea eel. The sushi here still is totally first rate. Melt in your mouth first rate. And I liked the big hunks of fresh marinated ginger. 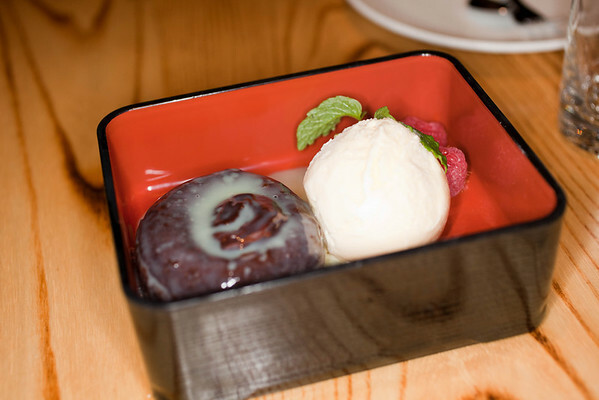 The vintage Matsuhisa dessert, “bento box” of flour-less chocolate cake with vanilla ice cream. It’s still a combo that works — even if it’s very overdone. They use a very high quality ice cream. 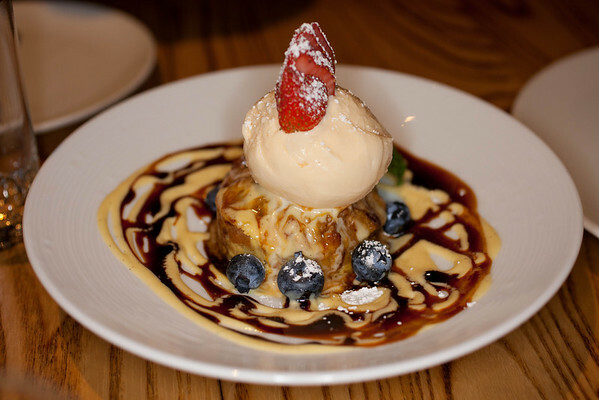 Banana bread pudding with vanilla ice creme and creme anglais. Even though I’m not much of a banana fan, this was really delicious. 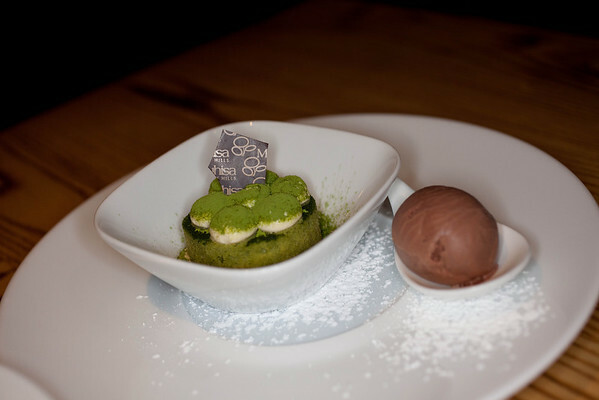 “Green-tea tiramisu with chocolate ice cream.” This was my least favorite of the three, although certainly not “bad”‘ in any way. Certainly Nobu has kept the quality level up. In an absolute sense things are as good as ever. One weird bit is that so many other places have copied the cuisine . Not that they do it better. Most don’t use the same quality of ingredients, or they overdo stuff, dumping too much spicy mayo or sweet sauce on everything. A perfect example of this is Sushi House Unico (REVIEW HERE). Like anything more or not always more. 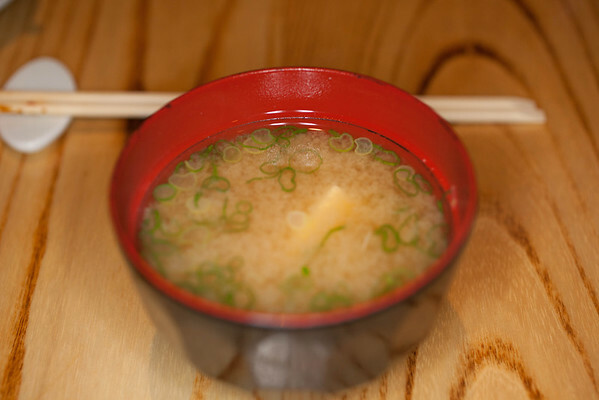 Not that Unico isn’t a perfectly tasty joint, but it isn’t in the same league as Matsuhisa. Takao (who used to work for Nobu) and the late Hump (memorial REVIEW HERE) are among the few places that have their own totally successful take on the style. But something that has also nagged at me for years is this, given how innovative the whole cuisine was to begin with, how relatively little has changed. Does each great chef have only one break through? Is innovation of this sort only done by the young? 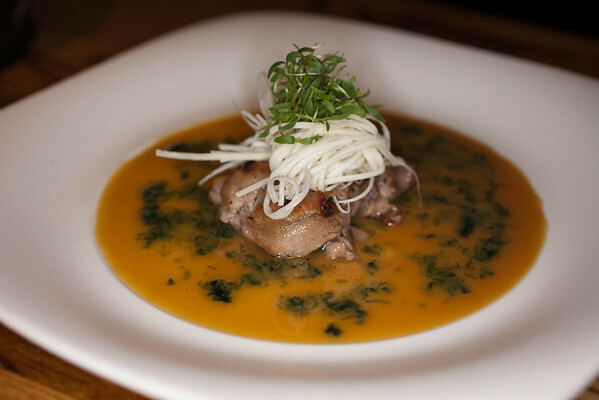 Or is the novelty born of the fusion of Japanese and Peruvian flavors? 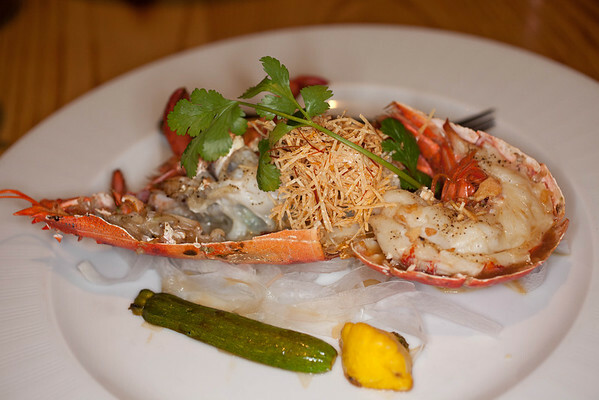 Maybe we need to send Nobu on a world eating tour! 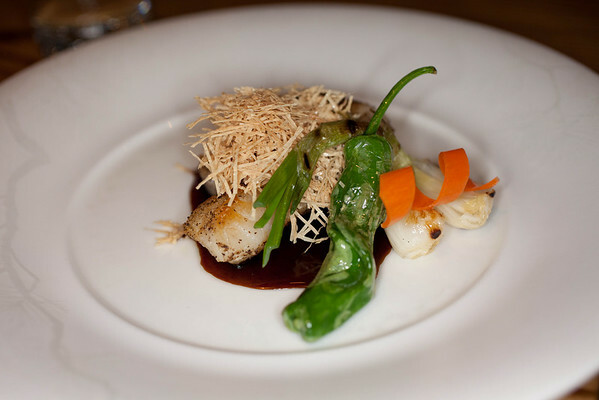 For a second review of Matsuhisa, in the private room, click here. 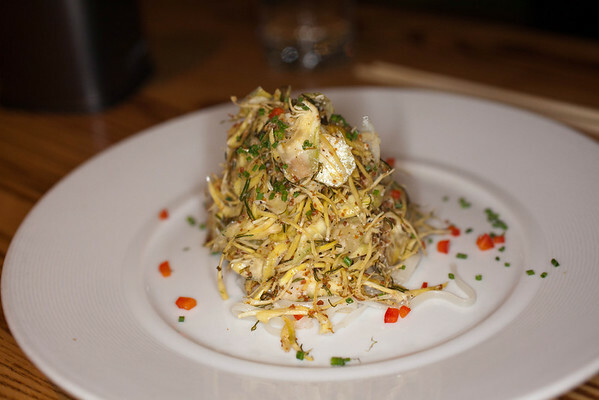 This entry was posted in Food and tagged Beverly Hills California, Cooking, Dessert, Fish and Seafood, Food, Japanese cuisine, Matsuhisa, Ponzu, Restaurant, reviews, Sauce, side dishes, Sushi, Tuna, vegetarian, Wine tasting descriptors. Sounds like you had a similar experience to my last visit here. Despite the proliferation of Nobu’s all over the world, Matsuhisa’s still got it! Yeah still better than Nobu. Although the big N is pretty dependable — I have no beef with it at all. The one in Malibu is one of the only good places in Malibu open late. Next up on my quest to fatten my midsection: Fraiche Culver city this weekend and Saam in 2 weeks! (been to Bazaar a bunch, figured I try Saam. Your E meal made me seriously green).